Aesthetics – The SOG Flashback or the CRKT Moxie? In this detailed head to head review, I will be ranking and comparing the SOG Flashback to the CRKT Moxie on a range of different criteria. Before reading this head to head review, you should check out both the SOG Flashback and the CRKT Moxie on Amazon so you are familiar with the knives that we will be debating. Before I jump in and start comparing them, some statistics to start you off. The SOG Flashback measures 4.5 inches closed and weighs 3.6 ounces. It features an elegant, flat ground, 3.5 inch, drop point blade with a black, hardcase, titanium nitride finish made from AUS-8 stainless steel hardened to 56-58 Rockwell. It showcases a Glass Reinforced Nylon (GRN) handle with a stainless steel “wrap” for a modern look. Jimping is provided in multiple places on the handle which provide a positive grip as well as a non-reversible, deep carry, pocket clip for tip-up carry. In addition, this knife features SOG's S.A.T. (SOG Assisted Opening Technology) which, according to SOG, gives this knife the fastest assisted opening blade available which is locked in the open position by their proprietary Piston Lock and which is locked in the closed position by a safety mechanism with a visual indicator window similar to that featured on many firearms. The SOG Flashback retails for around the hundred dollars mark. The CRKT Moxie (designed by custom blade-smith Mathew Lerch), measures 4.1875″ closed and weighs 3.1 ounces. It features a, black, satin finished, hollow ground, 3 1/4″, Drop Point blade made from 8Cr14MoV stainless steel with Rockwell Hardness of 58-59 and CRKT's Fire Safe release button which is incorporated into the thumb stud such that all the user has to do is press “down and out” on the thumb stud and, as the blade starts to open, the OutBurst assisted opening mechanism causes the blade to spring into the open position where the Walker-style liner lock then locks the blade in place. Furthermore, it features stainless steel liners with with molded, hard plastic, interframe, handle scales with black, textured, Kraton rubber, inserts for a positive grip. Plus, the handle is available in your choice of three color combinations consisting of a black blade with a black handle, a black blade with a gray handle, or a black blade with a green handle and a non-reversible, tip-up, pocket clip. Lastly, the CRKT Moxie retails for around sixty dollars. Concerning the appearance of these two knives, let me start by saying that I like them both! What first captured my attention about the SOG Flashback is the innovative GRN handle with the stainless steel wrap which is a design that I have not seen on any other brand of folding knife. Also, I happen to really like the slim, Drop Point, blade design combined with the long swedge and the jimping on the spine which provides extra grip for the user's thumb which, when combined with the unique handle design, imparts a very modern, space age, look to the knife. On the other hand, the CRKT Moxie is also a visually appealing knife with its black, Drop Point, blade and black, gray, or green GRN handle scales with decorative Kraton rubber inlays and unobtrusive Walker-style liner lock. In addition, I really like the graceful curves incorporated into the handle since they look like they would be more ergonomic than the handle of the SOG Flashback. However, since the purpose of this section is compare the aesthetics of both knives, I find that I am slightly more drawn to the appearance of the SOG Flashback over the CRKT Moxie. Concerning the blade design of these two knives, they are so close that it is somewhat difficult to choose between the two but, I do find that I like the blade design of the SOG Flashback slightly better than I do that on the CRKT Moxie because the blade of the SOG Flashback features a straight edge with a sweep at the tip whereas, the blade design of the CRKT Moxie features a long, continuous, curve. I tend to prefer the blade design of the SOG Flashback over that of the CRKT Moxie. Furthermore, the blade of the SOG Flashback has no Choil and a miniature Ricasso and thus, the back of the cutting edge is about as close the user's hand as it is possible to make it which in turn, increases the amount of leverage the user can place on the blade. Whereas, the blade of the CRKT Moxie feature both a large Choil and a large Ricasso, neither of which I like, and thus, it places the back of the cutting edge much farther from the user's hand which reduces the amount of leverage that can be brought to bear on the blade. Therefore, I have to rate the blade design of the SOG Flashback significantly higher than that of the CRKT Moxie. AUS-8 is a Japanese-made, high-carbon, stainless steel that is an excellent choice for an everyday carry blade steel because it contains 0.70 – 0.75% Carbon, 13% – 14.5% Chromium, 0.49% Nickel, 0.10% – 30% Molybdenum, 0.10% – 0.26% Vanadium, and 0.50 % Manganese. Therefore, it is a reasonably tough and highly corrosion resistant stainless steel that is commonly used for knives that will see hard use. 8Cr14MoV is a Chinese-made stainless steel roughly equivalent to Japanese AUS-8 (aka 8A) that contains 0.80% Carbon, 14% Chromium, 0.22% Nickel, 0.22%, Molybdenum, 0.14% Vanadium, and 0.16 % Manganese. Also, despite the fact that (or perhaps because of) this steel is a Chinese blade steel, it is starting to see widespread use in American-made knives and, according to the reviews and comments I have read, it seems to be an excellent blade steel for every day carry knives that will hold an edge slightly better than its counterpart 8Cr13MoV but, is slightly less impact resistant due to its lower Manganese content. However, as with any blade steel, edge holding ability is solely dependent on how the steel was hardened as well as the blade geometry, the blade grind, and the bevel angle of the cutting edge. So, in looking at the composition of these two stainless blade steels, the only difference that stands out to me is that AUS-8 has a significantly higher Nickel content than 8Cr14MoV which serves to make the steel both harder and more corrosion resistant and a significantly lower Manganese which serves to make the steel more abrasion resistant. Consequently, I don't believe that the casual user is likely to notice any significant difference between the performance of these two steels except that AUS-8 will be slightly more corrosion resistant. Last, I see that the blade of the SOG Flashback (AUS-8) is hardened to 55-58 Rockwell where as the blade of the CRKT Moxie (8Cr14MoV) is hardened to 58-59 Rockwell which again is so close that I don't believe that the casual user will see any significant difference. So, all things considered, I am inclined to rate the AUS-8 stainless steel slightly higher than the 8Cr14MoV although, they are both excellent blade steels for every day carry knives because they are both reasonably tough, highly corrosion resistant, and will hold an edge very well but, are not as difficult to sharpen as blade steels such as 154CM, ATS34, or D2. According to the SOG Web site, the base material for the handle of the SOG Flashback is made from Glass Reinforced Nylon (GRN) which means that it has tremendous structural strength for a plastic handle material which precludes the need for liners and the addition of the stainless steel “wrap” serves to both augment this strength as well as add a bit of flash to the handle. However, it is conceivable that the stainless steel cover could be subject to both surface scratches and minor denting if the knife is carried in a pocket with change or keys or is dropped on a hard, textured, surface. On the other hand, the handle of the CRKT Moxie features stainless steel liners with “interframe” handle scales made from Polypropylene Thermoplastic Elastomer (PP TPE) which is a class of copolymers usually consisting of a hard plastic and a rubber (in the case Kraton rubber) in which the hard plastic is milled in such a way that the rubber can be inlaid into the void or voids created by milling. So, how do I rate these two handle materials? Well, first of all, because the plastic used on the SOG Flashback is reinforced with glass fiber as opposed to the non-reinforced plastic used on the CRKT Moxie, the GRN is going to be significantly stronger than the PP TPE. 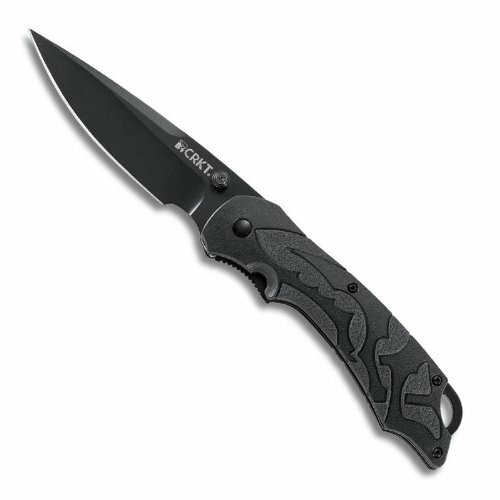 But, since the CRKT Moxie also features stainless steel liners, I don't see this as being a significant consideration. However, I do see a significant difference in the sureness of the gripping surface of the SOG Flashback over that on the CRKT Moxie because the stainless steel cover on the SOG Flashback is noticeably smoother and thus provides a less positive griping surface than the surface of the CRKT Moxie due to the Kraton rubber inlays. In addition, it occurs to me that if the SOG Flashback were to be carried in a front pocket during the winter months, then its grip is likely to be somewhat uncomfortable to handle do to the cold metal surface which is not a problem you would experience with the PP TPE handle of the CRKT Moxie. Consequently, for the above mentioned reasons, I am inclined to rate the handle material of the CRKT Moxie slightly higher than the handle material of the SOG Flashback. While both the SOG Flashback and the CRKT Moxie feature assisted opening mechanisms which cause the blade to spring open once the user has rotated the blade toward the open position a few degrees, these two mechanisms employ very different methods of actuating the blade. For instance, SOG Assisted Technology (S.A.T.) works through the balance of opposing, high-tension, coil springs. Therefore, as you initiate the opening action, the force propelling the blade open becomes greater than the force keeping it closed. Thus, the result is a blade that springs open instantly once it's engaged, seemingly on its own. The CRKT OutBurst assisted opening mechanism employs a long torsion bar which engages a cam on the internal portion of the blade. Thus, the cam is ground so that when the blade is closed, the spring provides bias to keep it closed but, when the blade is nudged open past 20 to 30 degrees, the spring leverage changes to propel the blade fully open. Both of these systems feature a safety that locks the blade in the closed position and, although the SOG Web site fails to explain how their safety works, it does show that the SOG Flashback features a visual indicator window so that when the window appears white when the safety is engaged and when it appears red, the safety is disengaged. The CRKT site on the other hand explains that their Fire Safe system works by employing a pin which engages the locking liner so that the blade cannot be actuated until the safety button on the end of the thumb stud is firmly depressed and the thumb stud is nudged outward. Then the OutBurst assisted opening mechanism takes over and instantly opens the blade for use. Consequently, there again, I can see no significant difference between these two systems except the SOG claims that their S.A.T. opening mechanism is the fastest assisted opening mechanism on the market today. Since I see no significant difference between these two systems for the casual user, I am inclined to rate each equally. Concerning locking mechanisms, the SOG Flashback features a Piston Lock mechanism which consists of a bar that is positioned between the liners with a coil spring placed behind the piston to provide positive pressure such that is slides forward to rest in a notch milled into the side of the blade's tang to lock it into the open position and, when the piston is manually moved to the rear, the blade's tang is released so that the blade can be closed. The Liner Lock used on the CRKT Moxie actually hails from the a design used in the late 1800's on electricians knives to hold a screwdriver blade in the open position but which was drastically improved by custom blade-smith Michael Walker in the 1980s. Walker's design employs a split liner with a curved upper section that rests against the side of the blade's tang as opposed to its edge so that when the blade is rotated into the open position, the curved leaf spring moves into position behind the blade's tang and locks it in the open position. Thus, to unlock the blade, the Liner Lock is pushed to one side with one's thumb which releases the blade and allows it to close. Consequently, the Liner Lock is the marginally stronger version of the two designs because, when pressure is placed on the blades cutting edge, the force generated is transmitted to the entire liner whereas, with a Piston Lock, when force is placed on the blade's cutting edge, the force generated is transmitted to a short piston or bar which is forced back against a stop inside of the liners. It should be noted that this difference is so slight that it is practically insignificant to the casual user and thus, the real difference is that the Piston Lock is actuated by moving a button to the rear whereas, the Liner Lock is actuated by moving the liner sideways. But, either design can be operated with a single hand without changing one's grip on the handle. Because I have an illogical prejudice against Liner Locks, I have a distinct preference for the Piston Lock used on the SOG Flashback instead and thus, I am going to rate the SOG Flashback somewhat higher in this category than the CRKT Moxie. * Due to fluctuations in the market, and special discounts – you should check the prices of both knives on Amazon to see the most up to date price. View the SOG Flashback and the CRKT Moxie on Amazon to check the latest prices. When it comes to weighing the value of these two knives, is seems to me that because there are no glaring differences between either the blade steels or the quality of the handle materials, I feel that the CRKT Moxie with a retail price of $69.99 is a better value for the money than the SOG Flashback with its retail price of $115.00. Concerning my personal preference between these two knives, I am inclined to choose the SOG Flashback over the CRKT Moxie because I like both the appearance of the Flashback and its blade design slightly better than the CRKT Moxie. In addition, although there is really no logical reason for my prejudice against liner locks, I do have one and thus I like the Piston Lock featured on the SOG Flashback better. In addition, SOG has a long standing reputation for making very high quality knives and, while I cannot honestly say that the SOG makes a better quality knife, my visceral feeling is that they do. I am going to award the SOG Flashback a higher rating in this category than the CRKT Flashback. Last, in adding up the numbers, I see that these two knives have run very close race but, the SOG Flashback just barely tops the CRKT Moxie on the Folding Knife HQ ranking chart.